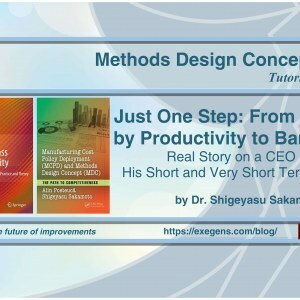 As I have presented in previous episodes, Productivity Business Model (PBM) is the framework in which the MCPD system develops. 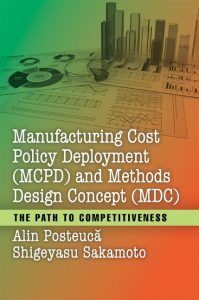 Therefore, continuous identification of the steady growth directions of manufacturing profit, based on productivity gains, by reducing manufacturing unit costs and by increasing the sales volumes achieved and sold, requires the continuous development and implementation of a company-wide productivity master plan to translate the managerial vision and mission of productivity in specific and ongoing activities and actions to improve the production flow productivity for each product family cost (PFC), based on the ongoing recovery of productivity policy deployment. 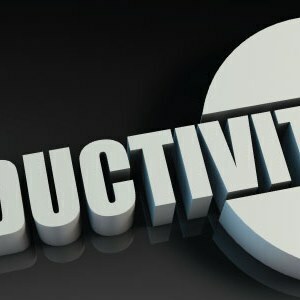 Often manufacturing companies have methods, techniques, and tools to tackle productivity and quality (TPS, Lean, TPM, SixSigma, WCM, and so on), but real improvement, continuous targeting of improvements to profit, and financial quantification of results are often left to be expected. Annual and multiannual profit level planning requires targeted planning of successive productivity improvements based on current and future state of sales trends and necessary manufacturing capacities – market-driven trends (customers, suppliers and especially competitors) and by the current state of the manufacturing flow. 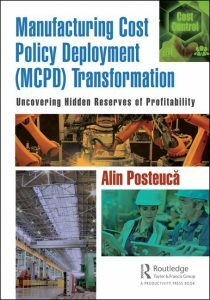 From the perspective of MCPD, the annual and multiannual manufacturing targets profit through productivity represents a predetermined stake, a stake of the strategic reduction of Cost of Losses and Waste (CLW) and for Critical Cost of Losses and Waste (CCLW). Typically, CLW accounts for 30-40% (sometimes even around 50%) of the total cost of a manufacturing company and we seek to target productivity improvements as close to the ideal cost or zero cost of losses and waste (CLW) as possible for each PFC and for all company. achieve cost targets at shop floor level. 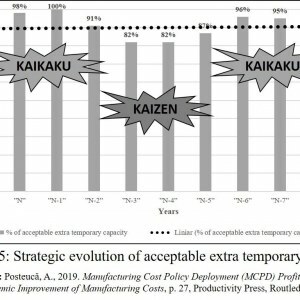 The MCPD system approach is a structured approach, following the same 3 phases and the 7 steps, both at the company level, at each PFC level, and at the level of each kaizen and kaikaku project for Manufacturing Cost Improvement (MCI) (see the figure below). 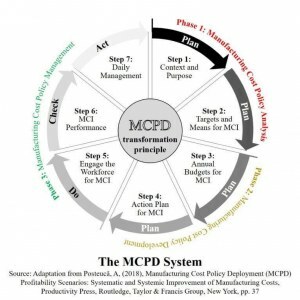 Going forward, the core annual and multiannual challenge of manager teams is to set targets and means for Cost of Losses and Waste (CLW) and for Critical Cost of Losses and Waste (CCLW) to consistently perform MCI for each PFC amid the compliance with the core principles of the MCPD system. 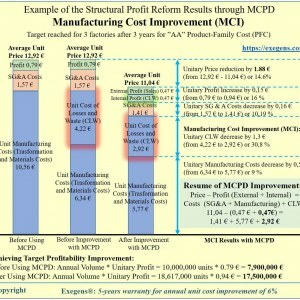 The tangible effects of applying the MCPD system can be found both at the level of each PFC process and at the profit and loss statement (P&L) level due to the development and use of annual manufacturing improvement budgets (AMIB) for existing and future products and at the level of cash flow statement due to the development and use of annual manufacturing cash improvement budget (AMCIB). Continuous support for the perennial results of manufacturing companies at the level of turnover, operating profit, product number converging to market share, quality, delivery and safety and morale to support Company Productivity Vission (CPV) and Company Productivity Missions (CPM) requires the development of Productivity Master Plan (PMP) for each PFC and for the overall company, irrespective of whether scenarios hypostases are stressing the role of external manufacturing profit through maximizing outputs (E) or increasing the role of internal manufacturing profit through minimizing inputs (I) and whether sales are rising or declining in one period or another. Continually improving inventory levels (I). Cost of Waste: Packaging Inventory. continuous improvement of contextual managerial behavior (Management Branding), etc. So, typically, CLW accounts for 30-40% (sometimes even around 50%) of the total cost of a manufacturing company and we seek to target productivity improvements as close to the ideal cost or zero cost of losses and waste (CLW) as possible for each PFC and for all company. The MCPD system warranty is to reduce annual manufacturing costs by 6% for 5 consecutive years. What elements are needed for business leaders to have a great MCPD System to support the continuous improvement cost and culture at the shop floor level?